You can have a look at the checklist here. We hope any city across America will find these recommendations helpful, whether they’re looking to build and run their own fiber network or attract an existing provider to do it. 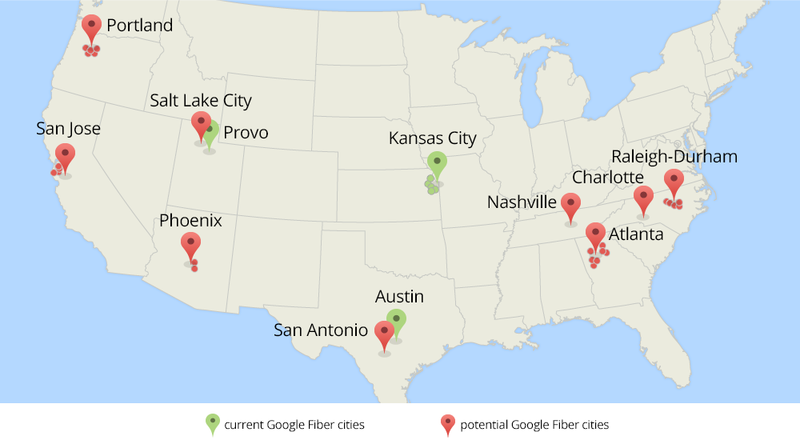 There’s nothing special or exclusive here for Google Fiber; rather, it’s a compilation of best practices from The Fiber to the Home Council, Gig U, the US Conference of Mayors and other industry experts, and it’s designed to be a practical, actionable roadmap that makes building new networks easier, faster and less disruptive. This is just the beginning of many conversations with these 34 cities — and it’s already clear that taking the time to get to know each other and talk about these topics now will help them feel prepared for a big construction project, and will help us bring Fiber to more people faster. We’ll continue to share what we learn on this blog, for all of the other cities across America who are interested in what it takes to get ready for a gig. (PDF) working hard to build networks with speeds 100 times faster than what most of us live with today. People are hungrier than ever for faster Internet, and as a result, cities across America are making speed a priority. Hundreds of mayors from across the U.S. have stated (PDF) that abundant high-speed Internet access is essential for sparking innovation, driving economic growth and improving education. Portland, Nashville (PDF) and dozens of others have made high-speed broadband a pillar of their economic development plans. And Julian Castro, the mayor of San Antonio, declared in June that every school should have access to gigabit speeds by 2020.
, a communications policy expert and advocate for the interests of local communities, the President of CTC Technology & Energy and the immediate past president of the National Association of Telecommunications Officers and Advisors (NATOA). We asked Joanne to pull together her recommendations on how local communities can become more “fiber-ready.” She recently published this advice (with financial support from us) for local leaders in a paper called Gigabit Communities, and she’s joining us as a guest blogger to talk about her suggestions. In 2009, city leaders and residents in Chattanooga made a bold decision — they built a new local fiber-optic network so that they could have widespread access to faster broadband. Years later, the decision has paid off; according to the New York Times, the network has helped to create jobs and spur economic growth. This success story is just part of the recent wave of interest in next generation fiber-optic networks that seems to be sweeping the country as local governments are increasingly looking for ways to bring faster broadband and more competition to their communities. Building a network like Chattanooga’s might not be possible everywhere. But there is an alternate option — as an advisor to many communities, I’ve seen that that there are certain steps that cities and counties can take that could help attract fiber companies to build private local networks. Institute “dig once” policies. When private companies build fiber networks, one of the biggest costs is stringing physical fiber lines throughout an entire community, which requires either digging up streets (to put fiber underground) or installing new utility poles (to string fiber in the air). If localities want to attract fiber providers, they can help to make this future construction much easier by instituting what’s called a “dig once” policy. Every time the city does road maintenance or needs to dig up streets to reach water or sewer pipes, they can install fiber conduit while they’re already down there. Then, they can make that conduit available for providers to lease and pull their fiber through. Not only is this an attractive option to providers who save the time and expense of digging, but it has the added benefit of reducing future disruption for local citizens (who probably don’t want to deal with a future road closure if it can be avoided). Alternatively, the locality can install large bundles of fiber and make that available to companies or non-profits who want to build state-of-the-art broadband. In our experience, the strategy of building conduit or fiber whenever possible is the single-most powerful, cost-effective step a locality can take to enable new network development. Compile current info on local infrastructure. Another thing cities and counties can do is to compile a lot of the local infrastructure information they already have — like where existing utilities are — and make that data accessible to potential network providers. Making this information available will help potential partners kick-start their network planning without having to survey and record the data themselves. In turn, local governments will be able to start substantive conversations with these providers much faster. Streamline local government processes. Finally, cities and counties can take a look at some of their existing government processes and think about how to streamline and standardize them. For example, building a fiber network can require a lot of construction permits. By establishing a standard permitting process and publishing it for potential providers to see, localities can clearly indicate to network providers that they’re ready for a major infrastructure project. These providers can play a role, too — if they decide to build fiber in an area, they can share their building plans with localities ahead of time, and determine a rolling timeline of permit requests, to save localities from being inundated with thousands of permits at once. These are just a few recommendations — but after working in this industry for almost two decades, we have many more tips for helping cities get ready for the fiber-optic networks that are the future. We also have case studies and engineering analysis, all compiled into a report, which can be found on www.Gigabit-Communities.com. We truly believe that fiber networks are essential to our communities’ future economic and community development, and we hope our experiences can help localities as they work toward that fiber future. Ed. Note: Local governments from across America often ask us about what they can do to prepare their communities for fiber networks. We’ve learned a lot from our work with KC, Austin and Provo — but we were also curious about what a longtime industry expert might recommend. That’s why we turned to Joanne Hovis, a communications policy expert and advocate for the interests of local communities, the President of CTC Technology & Energy and the immediate past president of the National Association of Telecommunications Officers and Advisors (NATOA). We asked Joanne to pull together her recommendations on how local communities can become more “fiber-ready.” She recently published this advice (with financial support from us) for local leaders in a paper called Gigabit Communities, and she’s joining us as a guest blogger to talk about her suggestions.